This might be old news to some (happened in Apr 05) but I just happened to come across it. Apparently last year (around Apr), hundreds of toads in Germany were found to self-explode with their entrails propelled up to a meter away! Baffled? So were everyone back then including the scientists. 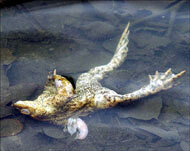 They have even closed the pond where these toads lived (and exploded) and named the place “The Pond of Death”.